Lauren attended Bowling Green State University in Bowling Green, OH achieving her Bachelors in Applied Health Science. Then she went on to attend Owens Community College where she graduated from the Physical Therapist Assistant program with honors. Her experiences span from acute care to Skilled Nursing Facility to out-patient clinic treating various pathologies (such as torticollis, TMJD, PF, vertigo, etc.). 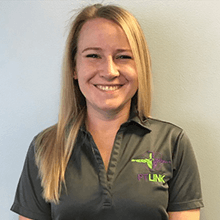 Lauren has been with PT Link since summer of 2016.